Gloria’s (Anne Hathaway) life is a mess. Gloria is a mess. When her boyfriend Tim (Dan Stevens) tells her things have to change or she has to move out, she decides to move back to her hometown to live in her parents’ empty house, instead of going to rehab which would have probably been the better choice. Once there she starts working for her childhood friend Oscar (Jason Sudeikis) and keeps partying hard. When reports surface about a giant monster that terrorizes Seoul, Gloria starts to realize that the monster is connected to her somehow. Colossal has a fun concept that works over long stretches as a metaphor but not always. I enjoyed it, despite a few misgivings. The thing I struggled with most was: why Seoul? Why not an American town? Or if Seoul, why not (American-)Koreans as the protagonists? With white people stomping all over an Asian city, this could have been made into a point, but it wasn’t and so it smacks of exoticization and white-saviorism. The other thing was that they fell out of the metaphor the monsters are a little too much. If there had been more consistency here, it would have worked much better as a parable about abuse and abusive relationships. However, it still works, even when it isn’t perfect about it. But there is a lot that I appreciated about the film (even though it didn’t have enough Dan Stevens). I liked the turns the story takes and I especially liked the way Oscar was characterized. He was also excellently portrayed by Sudeikis who departs from the roles we usually see him in a little here. And the entire thing was fun to watch. It made me laugh and made time fly by as I watched it. That it has something to say is a bonus, at least if you ask me, but even if it hadn’t, it would still be two hours of good entertainment. 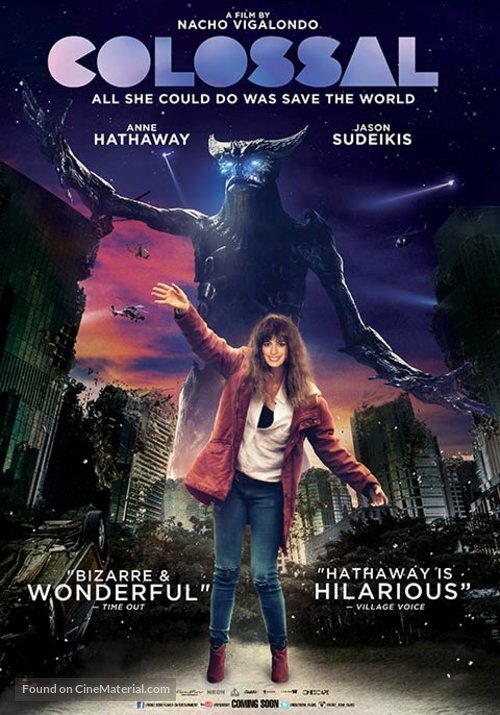 This entry was posted in movies and tagged /slash Filmfestival, 2016, Anne Hathaway, Austin Stowell, Colossal, Dan Stevens, Jason Sudeikis, Nacho Vigalondo, Tim Blake Nelson by kalafudra. Bookmark the permalink.